Cooking is an art and a science. This hands-on hobby is not only fun, but an excellent skill to hone and develop. Cooking classes provide the perfect opportunity to brush up on those skills. 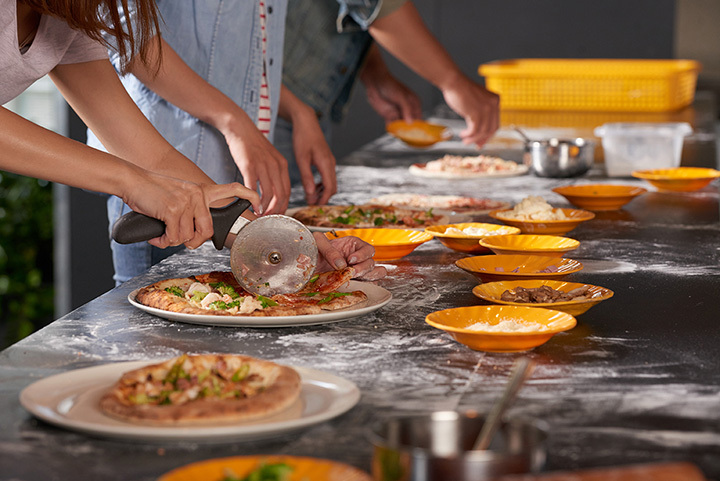 Whether it’s private one-on-one classes or for a team-building exercise, the tremendous cooking classes of North Carolina will turn you into a master chef in no time. Here are the 10 best in the state! Learn some basic kitchen skills or choose to attend a class where the food is made and explained in front of you at the Seasoned Gourmet. The classes are not only educational, but they are fun and exciting, making for a delightful evening. Hands-on cooking classes are made fun at Chapel Hill Cooking Classes. Cook with your group, have a private session, or use the kitchen as a fun team-building exercise. Chef Amanda uses personal recipes that are easy to replicate in the future and creates an enjoyable, relaxing environment while preparing your delicious meal. Learn more about food, learn some new interesting kitchen techniques, and, of course, cook amazing dishes. Take a cooking class with Chef Alyssa for an awesome, unique experience you will not forget. There are five different class levels so that the chef can improve your current abilities during a class. Local ingredients are used in the dishes you create, and once the cooking is complete, you get to enjoy your delicious meal. The atmosphere in the classes is warm and inviting, making the class not only fun but comfortable. Whip something up in the kitchen, learn and have a great time without stress. Sur La Table of Huntersville is a high-quality location to purchase kitchen items and to take hands-on classes. Classes such a Dutch oven cooking, sheet pan suppers, knife skills 101, how to wok fry vegetable pad Thai are just a few of the classes led by several different chefs. Attend unique, delicious cooking classes that are sure to exceed your highest expectations. The fantastic classes are led by amazing instructors who bring the fun and entertainment to class! The scheduled classes are constantly changing and fill up quickly, so you must be fast to save your spot. Novice in the kitchen or seasonal cook, there is a lot to learn at the Flavor Exchange! Feel right at home with an enjoyable class with an instructor that is knowledgeable and works at a great pace. Take on new skills with creating appetizers, sushi, and more. Date night has never been more perfect, interesting, or tasty! Experience cooking the way you most prefer through open classes, teen cooking, hands-on dinner, in-home dinner, or team building events. Italian, Swiss, pasta, French, and Southwest classes are just a few on the schedule at Reto’s. Leave class with not only the delicious food you have created but new knowledge. Use the new skills and recipes from class in your own kitchen. Food fanatics of all ages will enjoy the classes held at Wynton’s World Cooking School. While in class, learn how to make a healthy, fresh meal and carry your new learned tips and tricks back home to share with family and friends in many meals to come. These small classes, 12 students at the most, allow every person to learn plenty of techniques while practicing through hands-on learning. Adult classes, family classes, and semester-long classes are all available and designed to gain skills and eat some awesome food after you work hard to make it! The adult classes are intimate classes where adults can relax and have the chance to whip up to four recipes! Students will work in groups anywhere from four to six individuals. The kids cooking classes are an excellent option for parent and child to bond over cooking. Semester classes are for your kiddos to make friends while having a fun time in the kitchen. Children can have their weekly class after-school or mid-day. Immerse yourself in the incredible experience of acquiring new cooking skills while learning in a warm, friendly atmosphere. You will cook your meal using fresh and quality ingredients, and you can learn anywhere between three to six dishes throughout the class. The delicious food and beautiful location offer cooking at Asheville Mountain Kitchen to be a great activity for team building or in a private group session.